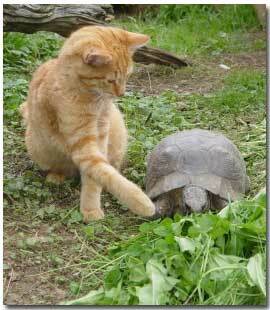 This "Tortoise With Cat" picture looks benign. What is the cat thinking? Why is its paw reaching for the tortoise? Are these true friends, or are they forced to be together? Don't be fooled by the fact that the tortoise has his head out of his shell. Not every tortoise that exposes his head wants peace. What do you suppose the tortoise wants? Is he about to put out his own front leg to shake hands? This "Tortoise With Cat" picture is all well and good, but I suggest you watch the video to see what really happens when you put a tortoise and a cat together.